We couldn’t do it without YOU! Here are some resources to help you make your fostering experience a smoother one for you and your foster-dog. Maintain regular feeding schedule. Anticipate some refusal to eat and/or overindulge. Begin crate training immediately. Begin a schedule of potty times. Begin a borderline boring routine of crate rest, play, and potty. 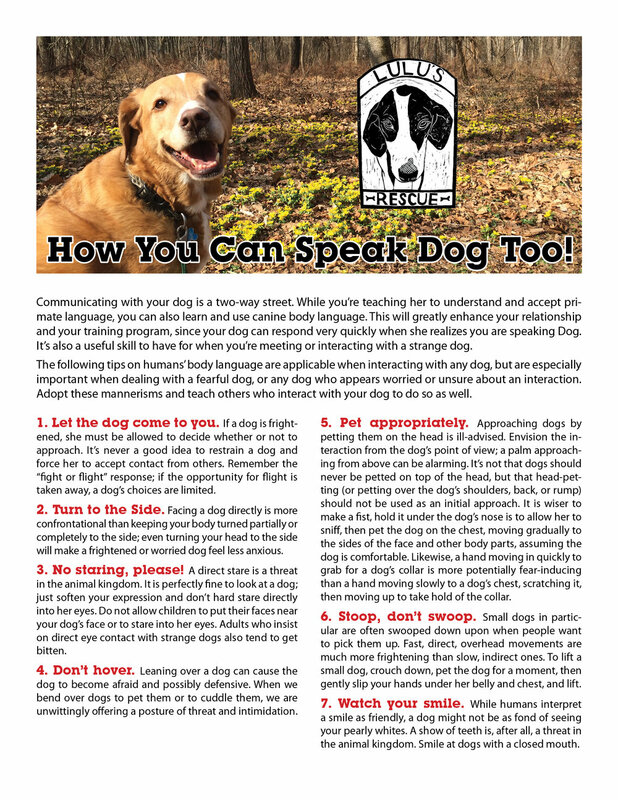 Observe signs of anxiety such as panting, tongue flicking, lethargic or over rambunctious behavior and understand this is normal after arrival. Introduce your foster dog to any resident dog slowly and on neutral ground. Take a walk together. Remove any toys or food that may promote confrontation. Set appropriate limits as you begin to socialize with people and dogs. See our 2 week shut down protocol. Begin preventatives / deworming as instructed at transport. Loose stools or frequent urination can be anxiety or a change in food. Mix pumpkin and/or sweet potato with food for the first couple of days to stabilize digestion. If your dog has diarrhea we recommend a bland diet of boiled chicken mixed with pumpkin or sweet potato and access to plenty of water. We recommend a bath as soon as your dog arrives if your dog seems comfortable with being handled. Observe any excessive diarrhea, constant scratching, or a rash. All our dogs are vetted and vaccinated however dogs can get sick during transport or develop an illness impossible to detect. Lulu’s is committed to having you foster a healthy dog. See our Kennel Cough Protocol here. Regularly attend our Meet & Greets with your foster. Meet & Greets are held every Saturday morning in different locations in New Hope, Chalfont or Newtown. Email johanna@lulusrescue.org to be added to our Sign-Up Genius so you can get email notifications or check our Lulu’s Facebook page or website for events. Please use the sign-up to let us know you will be coming. If you can’t make it, a volunteer may be able to pick up your dog. Indicate that on the Sign-Up. Strut your foster in an Adopt Me vest or bandana. If you have not been given one please ask for one. Try to teach your foster a trick or two- like sit or shake. Potential adopters love to see something fun. Provide great photos and/or video and short bio for our posting on Petfinder and Facebook. Please complete our Foster Dog Report Card by clicking here. (password is FostersRock!) and complete our form or email pics/video. You are a critical part of our process. Fosters are expected to watch the dogs for signs of illness, to give them enough exercise and socialization, to notice any problems with other animals and people, and report to Lulu’s: info@lulusrescue.org.